The Sky Factory was mentioned in the March 2009 edition of "Nails" magazine. 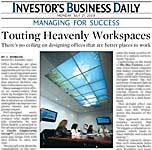 Create the illusion of open sky with SkyCeilings, thin edge-lit panels that mimic natural landscapes and are perfect located above shampoo bowls, reiki tables, or anywhere clients' heads may be upturned. Another alternative are traditional skylights.